During the past thousand years, the average winter temperature in Svalbard’s “capital” Longyearbyen has varied from minus 5 degrees Celsius around 1000 AD to minus 25 degrees around 1850. “Stories about how cold it was in Svalbard during the golden age of hunting and trapping in the 19th century are not exaggerated,” says senior research scientist Elisabeth Isaksson. Using ice cores from three of Svalbard’s glaciers, she and her colleagues have reconstructed a thousand years of variations in winter temperatures for Longyearbyen and for Vardø at the northeastern tip of mainland Norway. Winter temperatures have been measured since 1911 in Longyearbyen and since 1840 in Vardø. Researchers from the project Svalbard ice cores and climate variability (SVICECLIM) have combined these valuable time series with data from ice cores drilled at three different sites in Svalbard. The research has received funding under the Research Council of Norway’s programme Climate change and impacts in Norway (NORKLIMA). The researchers have made a particularly detailed study of a 121-metre long ice core extracted from the Lomonosovfonna glacier, 1230 metres above sea level. The ice at the bottom of the core is about 1000 years old. The proportions of the stable isotopes 18O and 2H in ice vary with temperature. Isotopic composition can therefore be used as a proxy for historical air temperatures before the period for which we have instrumental measurements. Thermometer measurements from Vardø and Longyearbyen overlap with the ice core data back to 1911 and 1840. The researchers used the measured temperatures from these two sites and the isotope data from the ice core from the overlapping time period (a method called “scaling”) to quantitatively reconstruct earlier temperature variations. “Data from a single ice core may not be representative. But we have used ice cores from several different parts of Svalbard, and can be fairly confident about our findings on climate fluctuations in Svalbard and North Norway as far back as the Viking Age,” says Elisabeth Isaksson. The period between the 1300s and the end of the 1800s is known as the Little Ice Age. The SVICECLIM researchers have found no evidence of abrupt temperature changes during this period. The SVICECLIM project has shown that trends in winter temperature in Svalbard and North Norway over the past thousand years can be roughly divided into three. To start with, there was the long period of steady cooling beginning in the Middle Ages. This was followed by the very cold period of the 1800s, and then by rapid warming that started in about 1900. “The rapid warming during the 20th century was already well documented. Now we have more reliable information on both the 1800s and earlier centuries. 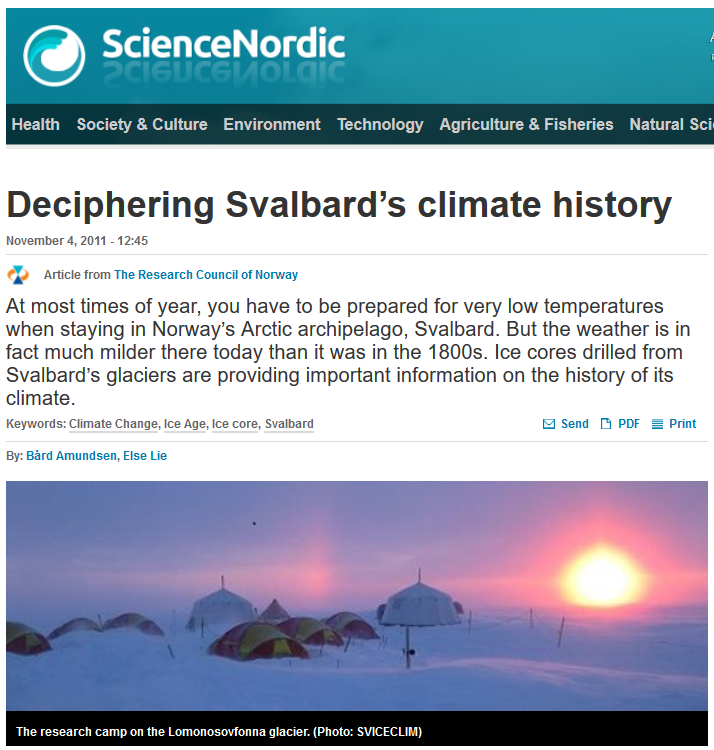 The ice core data suggest that Svalbard’s climate was about as mild in the 1300s as it is today. In fact, the summer temperatures may even have been higher,” explains Elisabeth Isaksson. Elisabeth Isaksson and her colleagues are by no means the first scientists to have drilled ice cores to investigate past climate change, but nobody has previously made such detailed studies of Svalbard ice cores. The best-known large-scale ice coring programmes have been carried out in Greenland and Antarctica. Some of the ice cores cover a much longer time span than those from Svalbard – the deepest ice core from Antarctica goes back 800 000 years. Svalbard has a maritime climate, which is strongly influenced by temperature fluctuations in the Atlantic Ocean. Greenland and Antarctica are much more like large continents with their own climate. This means that the ice core data from Svalbard complement data from Greenland and Antarctica. Elisabeth Isaksson and her team have also extracted other information from the ice cores. They have found evidence of the eruptions of the Icelandic volcanoes Laki and Grimsvötn in 1783 and 1906, Soviet nuclear tests in the 1950s and 1960s and the Chernobyl disaster in 1986. All these time markers are important for the researchers when they try to date the different layers of the ice cores. The researchers have also been able to study the spread of pollutants to the Arctic. We know that the spread of sulphur in the atmosphere started around 1850. Concentrations of pollutants such as PCBs, DDT and brominated flame retardants rose gradually during the 1900s, but have begun to decrease again as their use has been banned. Now new pollutants are appearing in the upper layers of ice on the glaciers.